Thanks to the rise of online shopping, same-day delivery has become a household term. It seems that almost every company is offering competitive rates and quick turnaround times to get your business. Shipping a car, however? It’s not quite as simple or fast. While it’s not the most convenient option, sometimes it’s your only one. Maybe you’re relocating your career. Or, perhaps you’re sending a vehicle to someone who lives out of state or receiving one from a long-distance dealer. In these cases, you need to figure out how to ship a car as safely and economically as possible. Thankfully, it can be done. Today, we’re taking a look at a few ways you can simplify the process and make sure you’re getting a solid deal. Before you start cleaning out your car or garage, it’s important to understand your options when it comes to auto transport. Here are the two main ones you’ll need to choose between. The first is terminal-to-terminal car shipping. Under this option, your vehicle isn’t traveling alone. Rather, it is grouped together with other vehicles traveling in the same direction. It arrives into and departs from a pre-designated location. The name comes from the airport process that follows the same concept. Just as an airport will have a central terminal where planes load and unload passengers, an auto transport company has a similar loading space. In fact, these areas are often located near major airports or highways for ease of access. Once you select this option, you’ll be responsible for making sure the vehicle is dropped off and picked up from its designated loading zone. You will be able to set the day and time that you’ll pick it up. You can also opt for a towing company to take care of the legwork for you, making sure your car is delivered and received when you’re ready for it. While terminal-to-terminal might be the least expensive of the two options, it also presents a few more benefits. For one, there is inherent flexibility. You’ll be given free reign over when your car is picked up and delivered. This means that if you’re stuck at work or the weather isn’t cooperating, you don’t have to stress over being home for an in-person meeting with an auto hauler. Rather, anyone you choose can take care of that step for you. Your car will be kept safe and secure while it’s waiting on the lot. Also, there are some situations, such as the aforementioned road conditions, that make it impossible for a large carrier to get to your doorstep. In these cases, terminal-to-terminal transport is ideal. The second option is door-to-door transport. This solution allows you more flexibility but can also be pricier. You’ll select the location where your vehicle will be picked up and you’ll also set a spot for it to be delivered. In turn, an auto mover will pick up and then deliver the car to the location that you select. Though this is a handy solution that can save you the headache of coordinating a terminal drop-off and pickup, it’s not without its restrictions. If your road is difficult to maneuver for any reason, from downed trees to being hilly or narrow in size, a driver might not be able to navigate to your doorstep. The same holds true if you live in an apartment complex or gated community with entrance restrictions. Why is this the case? While your driver, also known as an auto hauler, may only be transporting your vehicle, he or she could also be carrying a much heavier load. In fact, a multiple carrier can stretch up to 60 feet or more in length and carry up to 10 cars! As such, it becomes a little more complicated than simply delivering a package or parcel to your mailbox. If these obstacles are encountered, the driver will contact you and arrange to meet at a nearby location as close to the original spot as possible. Do you have a classic or exotic vehicle to ship? What about a vintage one? In these cases, door-to-door transport will afford you a more personalized, white-glove delivery. You’ll also be present when your car is delivered and picked up, giving you both confidence and peace of mind that your vehicle is in good hands and allowing you to supervise the process. On the day of the transport, you won’t have to worry about changing around your schedule or waiting by the phone. Your driver will contact you 24 hours beforehand to reconfirm the timeline. Then, one hour before arrival, you’ll receive a follow-up confirmation. While you’re researching the best ways to ship a car, you’ll run across two primary shipping options. Let’s break down the details of both. Have you ever driven down the highway beside a double-decker trailer carrying multiple cars on top and bottom, partially enclosed by a metal frame? That’s open car transport in action. Though it can be unnerving to drive beside such a monolith, this is actually the most commonly used means of transportation for auto delivery. It’s also the most affordable in most cases. Usually, those cars are going to a dealership, where they’ll take up residence on a car lot. Of course, if you’re considering this option, you’ll need to keep in mind that while your vehicle is being transported, it will be exposed to weather conditions and other roadway hazards. In many ways, this makes it similar to driving your car the same distance, though the mileage and wear and tear won’t be put onto your vehicle. Looking to mitigate those risks? Think about where you want your car to be placed, and ask accordingly. A top position might mean it’s less susceptible to leaking fluids from the cars below. Or, if you opt for a lower position, aim for one closest to the cab to shield it from thrown road debris. When it comes to protecting and preserving your high-end vehicle, a smooth and secure delivery is key. That’s where enclosed auto transport comes in. Instead of being on an exposed, open-air trailer, your vehicle will be placed onto a covered metal carrier. This is ideal for blocking out road debris and protecting your vehicle from inclement weather conditions. 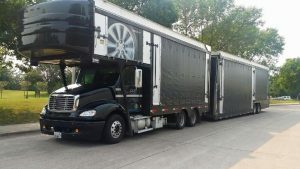 Most auto transporters will allow you to supplement your enclosed auto transport service with satellite tracking capabilities so you can visibly track your vehicle as it travels to its destination. Though these hard-sided carriers offer the most security for your vehicle, you may also select a soft-sided carrier depending on your budget and specific needs. This option is known as covered auto transport. Here are a few differentiators to keep in mind. A covered auto transport will be performed via a hauler that has a canvas covering, rather than a metal one. To ensure airflow, this covering will have a few strategically-placed holes within it. Though this option will usually be less expensive than an enclosed auto transport, it’s still a great way to keep your luxury car safe from the elements. 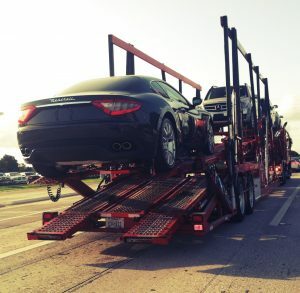 There is no shortage of auto transport companies available. That’s why it’s important to do your due diligence and get a few car shipping quotes before deciding on the one that’s right for you. As you start crunching numbers, remember that the closer your shipping or delivery location is to a major city, the lower your quote may be. This is because most terminals are located in busy metropolis areas and many trucking routes incorporate these areas as well. To make sure the quotes you receive are accurate, make sure you’re clear on your precise auto transport needs. For instance, if you receive a quote for an enclosed auto transport, door-to-door delivery of your non-functional, 20-year-old sedan, you might end up paying for a higher level of service than you require. On the other hand, if you need to relocate your brand-new Ferrari and your quote is for open car transport, terminal-to-terminal delivery, take a second look. You may need to consider if the cost-savings advantages afforded by this option outweigh the need to keep your vehicle as protected as possible. Any quote can raise your eyebrows if you’re not sure what you’re looking at. Go through it line by line to make sure you’re getting what you expect. Whether someone receives either an incredible of service or a terrible one, their next step is often to tell others about it right away. Thanks to the rise of digital media, this feedback is often captured online, much to the benefit of virtual shoppers. Before partnering with any auto transport company, consult recommendations and reviews from friends and relatives. Then, check out what others online have to say about their personal experiences there. 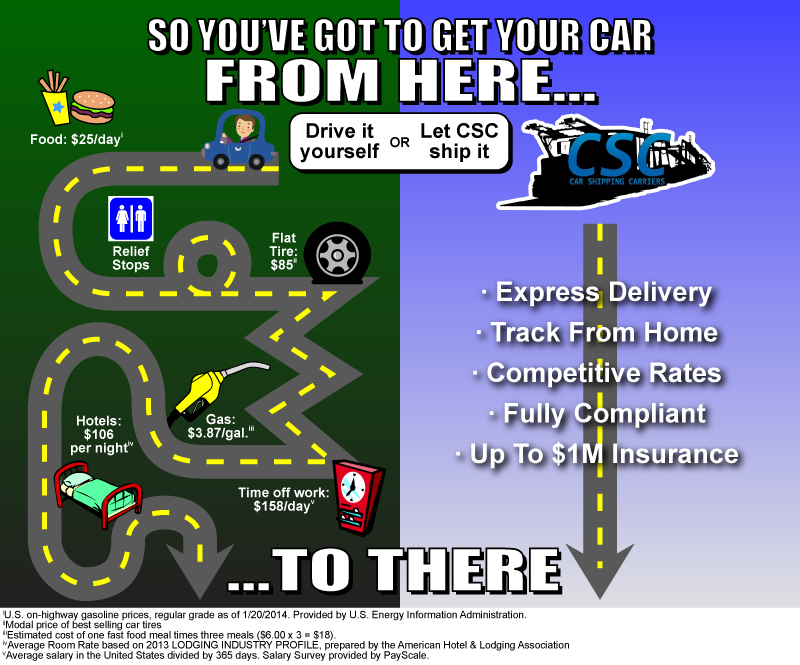 Remember, when it comes to auto shipping, choosing the cheapest way to ship a car isn’t always the best strategy. Instead, look for a company with consistently high feedback scores and excellent, verified customer reviews. By law, all auto shippers are required to carry cargo insurance as well as liability insurance. Still, though this protection can help insure your car against potential damage, it usually only covers a certain amount. 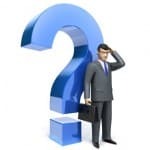 When you choose a company and receive your shipping order and bill of lading, the form will include a list of things not included in the company’s insurance policy. Upon review, you may decide to upgrade your auto insurance policy to a more comprehensive level of coverage that also includes theft and collision. Before and after the shipment, be careful to inspect your car thoroughly in the presence of a company representative. Take pictures throughout the process and make a note of new scratches, dings or anything else that looks out of the ordinary. In the event that you need to file a claim after you receive the vehicle, this kind of recordkeeping will come in handy. Throughout the process, it’s important to keep an open line of communication with your carrier. As soon as you find one you trust, go ahead and pay your deposit. Why is this a critical first step? Rates at auto transport companies can change daily. Once your deposit is paid, you’re locked in at that rate and protected from any future pricing upticks. After that is taken care of, iron out the details around the timeframe for auto pickup and delivery. Then, once you successfully complete the journey and accept your vehicle, you’ll be ready to pay for it in cash or using certified funds. A company representative will present you with a Vehicle Inspection Report, along with the aforementioned Bill of Lading. Look over both of these documents and make sure you’re satisfied with the condition of your vehicle. Are you ready to send your vehicle on the trip of a lifetime? It’s never easy determining how to ship a car in the best way, at the best price, with the best auto transport company around. Thankfully, we know a thing or two about the industry. 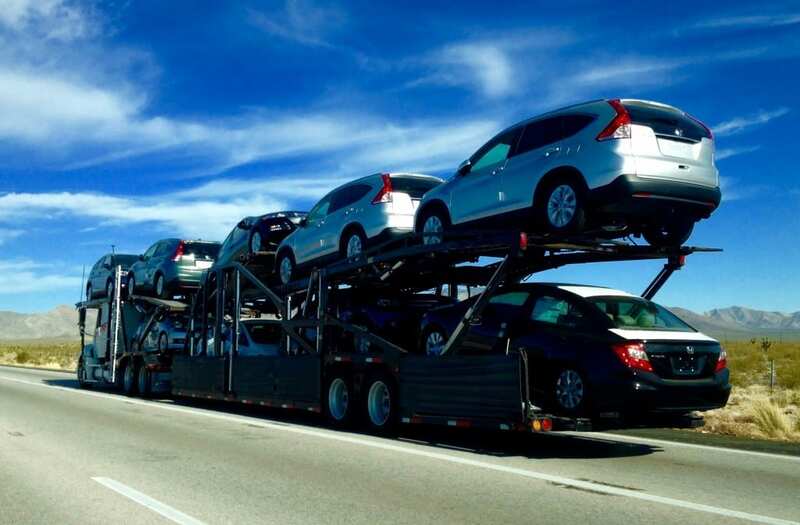 We have access to the most reliable auto shipping services in the industry, as well as the best quotes. Not only are we accredited through the Better Business Bureau with an A+ rating, but we also boast a bevy of five-star reviews across myriad online platforms. The companies we work with are vetted, screened and hold a 98% or higher rating with both the US DOT and FMCSA. Check out our prices today and request a free quote. You could save 30% instantly and you’ll never have to second-guess whether or not you made the right decision.